Based on its title, this exhibition speaks to the Daoist characteristic of bending to the elements to prevent breaking otherwise known as Daoist philosophy's following the ethical path. In fact Jang searches for his own identity through examining his Korean cultural past hearkening back even to animist beliefs. The latter inform the philosophies of not only Neolithic Korea but also modern history's, in its aspersion that all things even inert were imbued with spirit. Consequently, Korean mythology asserts that the five God spirits----Chunshin (sky-god) and Sushin (water-god) symbolized by the dragon, Sanshin (mountain god), Toshin (earth god) and the Kwishin (wandering-ghost) needed propitiation to provide for humans. 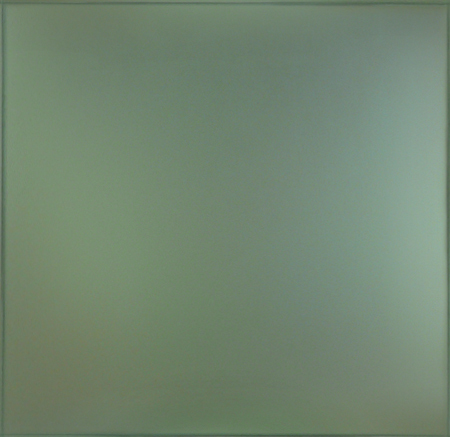 Day and night are seen as yin and yang and are full and empty simultaneously as seen in many of Jang's works but also in many other Korean arts. Traditional symbols and the five elements (fire, water, wood, metal, earth) and colors/directions also have a great impact on Jang's works and are seen in combination with prints, calligraphy and flowers. Jang's materials are also traditional consisting of hand ground pigments with Hanji paper on panel. So that, in Jang's work colors coincide with each element and motif as in Taste for the Arts-The Pear Blossom, 2012, (32 4/1 x 18 4/1") that depicts a blossoming pear branch overlain upon a flat brocade print of peonies. The blue background corresponds to the element of wood or east direction and its symbol is the dragon that relates to Taeguk cosmology that unites the yin and yang. A queen's imperial wedding gown contains all five colors but blue is the background with a red line as accent. Jang's bright blue background is embellished with calligraphy whose lettering is red and contains pear blossoms as did the royal gown, so that he not only shows awareness of historic traditions, but he contributes to their continuation and renewal. 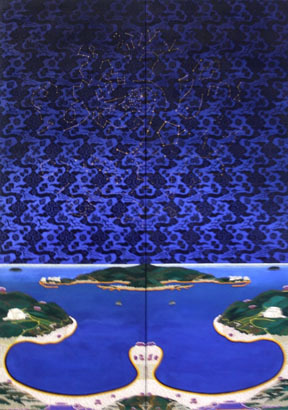 Jang's Rational-Bloom: Camellia, 2009, (67.5 x 24 in) depicts a gold silk brocade background overlain with the five elemental colors black, white, green/blue, and red in a horizontal ribbon that intrudes on our sight line from the top left. From the bottom right emerges a branch with a blossoming red camellia (Camillia sinensis) grown for centuries in the east before it arrived to the west. Camellia leaves can be used as a tea, and its cultural symbolism is deep and ranges from perfection, desire, to faithfulness and longevity. Jang's painting of the plant and blossom are executed with such illusionistic realism as to rival the famous ancient painter Xeuxis. So that the juxtaposition of Jang's patterns, colors and dimensions result in a playful yet expert virtuosity that nevertheless has deep meaning.